As soon as fall arrives, I crave hearty comfort foods that are packed with healthy ingredients. 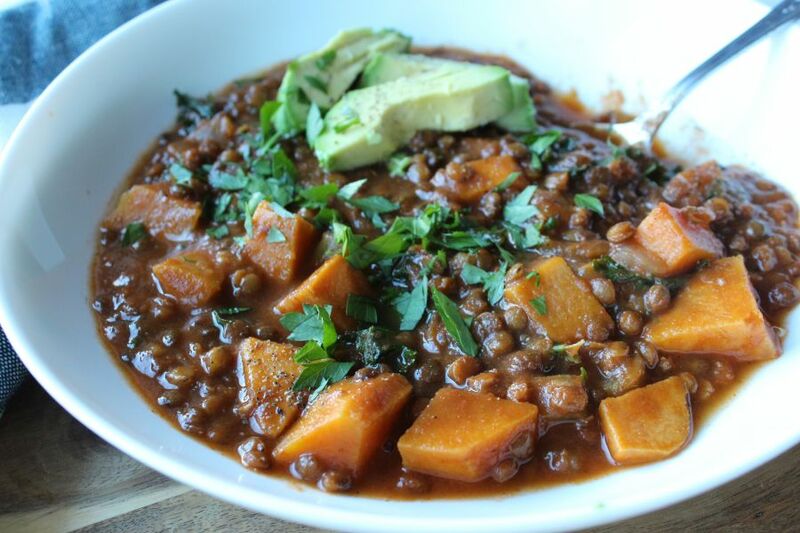 This vegan french lentil stew is going to become a regular on our weekly meal plan. It meets all my comfort food criteria: flavourful, hearty, and tastes better the next day. This stew is perfect for school and work lunches. 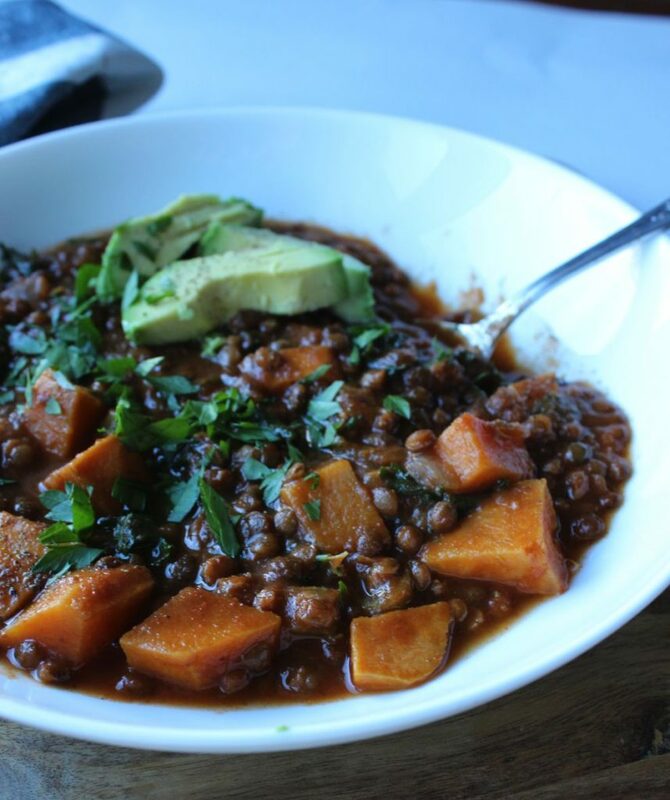 This vegan french lentil stew with sweet potatoes is a perfect healthy bowl of comfort. Pair this hearty lentil stew with a piece of crusty bread and you have a perfect nourishing meal. I have been making more vegan and vegetarian dishes. So far no one is complaining. A common misconception I hear is I am going to be hungry. Lentils are packed with nutrients, inexpensive, and versatile. In 1/4 of a cup there are 13 grams of plant protein and 18 grams of fibre, now that ought to fill up anyone, including carnivores. In addition, to being good sources of protein and fibre, lentils are packed with folate, essential for a healthy DNA. Lentils also contain iron, magnesium, and potassium and can be added to soups, salads, baked goods, and casseroles. I think Mr. D is finally realizing that vegetarian meals can be both filling and flavourful. 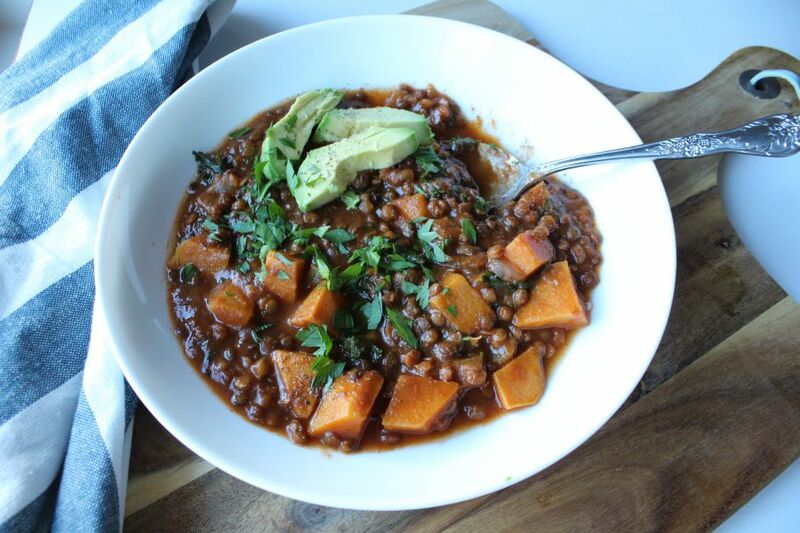 For this vegan french lentil stew with sweet potatoes I used french lentils from Grain, a Vancouver company who sources a variety of dry goods such as lentils, chickpeas, quinoa, and farro from Canadian farmers. I went easy on the spices for the girls but if you prefer more spice go ahead. Eating less meat is healthy for your heart. Did you know that heart disease is the number one killer in women. Fatty red and processed meats are high in saturated fats which can increase your LDL cholesterol, also known as bad cholesterol. A diet high in saturated fats may increase you risk for cardiovascular disease. Plant based foods such as lentils are high in fibre and protein but low in saturated fats. Research has linked diets high in red and processed meats to colon, prostate, pancreatic and gastric cancers. Plant based diets are high in antioxidants which have cancer fighting properties. A fellow dietitian, Desiree Nielsen, writes an excellent post on the link between meat and cancer. Raising animals consumption produces more green house emissions than all the vehicles on the road. Vegetarianism climate change, pollution while protecting valuable resources such as water. Many animals used for consumption are stored in dark, over crowded small cages, crates, and pens before slaughter. Furthermore, many are painfully slaughtered. Can’t imagine giving up that steak. You don’t have to. Try eating 1-2 meals per week such as meatless Monday’s. Have you heard of a new movement called “flexitarianism” A flexitarian is someone who mostly eats vegetarian but occasionally enjoys meats. What’s your favorite vegetarian food?